Dozens of mammal species can be found in Laguna de Apoyo Nature Reserve, Nicaragua, although most mammals are, by nature, retiring and difficult to observe. Among the exceptions is the variegated squirrel (Sciurus variegatoides). This species ranges from southern Mexico to Panama, but as its name suggests, its color pattern varies from one part of its range to another. Ours (subspecies S. v. dorsalis) are black and white, suggestive of an inverse polecat coloration. They are a prominent component of the wildlife, very visible and active during the day. 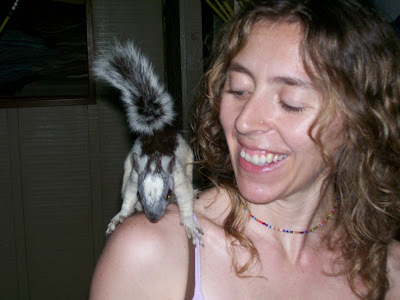 For more pictures of the squirrels of Laguna de Apoyo Nature Reserve, click here. 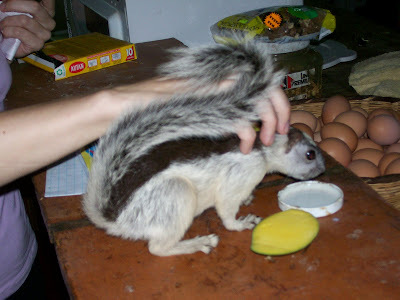 We have rescued several variegated squirrels over the years. One baby female survived a long fall (which killed one of its siblings) when Montezuma Oropendolas attacked the nest on the property of Estacion Biologica. She was so young and small that should could not climb, yet too large for her mother to carry her. We kept her, initially feeding her milk with a syringe. She knew where to find milk and a mango or banana awaiting her in the kitchen, and soon was able to scale the kitchen table. A rescued variegated squirrel drinks milk and enjoys a neck scratch. Photo by Jeffrey McCrary. Eventually, she built a nest in a tree overhead and stopped sleeping in the armpit of the station director! She continued to visit for a few months longer, but each day became less interested in people. Today she is a breeding adult and no longer descends from the trees to visit us. ﻿﻿Local wild squirrels have readily accepted our rescued animals. They are very social animals, and each morning, they play ecstatically, chasing each other round the trees. Below is another picture of a rescued squirrel who enjoyed his freedom early but loved to visit us - especially when we had peanuts or cooked red beans! He is also now a member of our neighborhood squirrel clan. 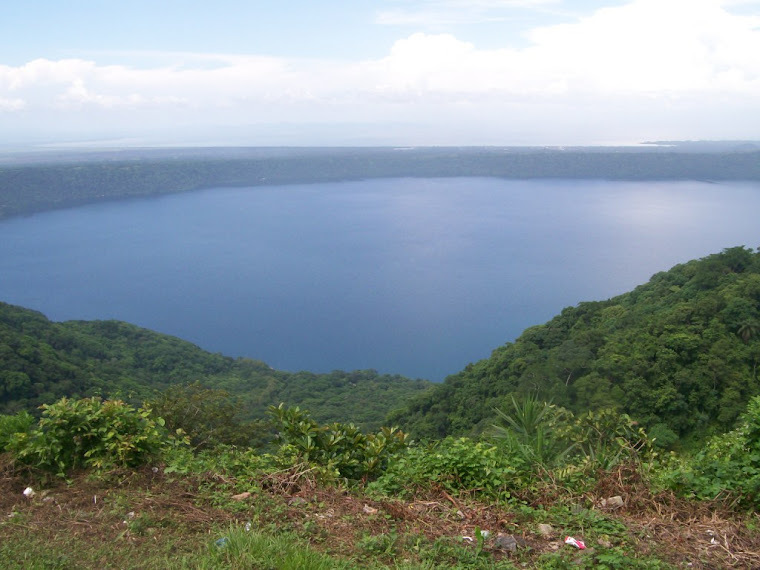 FUNDECI/GAIA manages a long term monitoring program on the flora and fauna of Laguna de Apoyo Nature Reserve, and we are involved in several actions to promote the protection of native flora and fauna in the area. We need volunteers and donations. Volunteers can help by doing such things as: assisting in field work to monitor birds, rodents, bats, moths, butterflies, monkeys, fish or birds; processing data; management and/or maintenance assistance at Estacion Biologica; reforestation; and other areas. If you can not give time as a volunteer, please consider making a small donation to us (apoyo@gaianicaragua.org via paypal). Our budget is small and needs are large. By participating in one of our programs such as the Laguna de Apoyo Spanish School, you also help. Would you like to learn or improve your Spanish? All our students provide volunteer hours in reforestation and other conservation activities. And a portion of the proceeds of the Spanish training goes directly to our study and conservation of wildlife and their habitats. Or you can visit and hire a guide for nature tourism in our area. Our guides know the local fauna better than anyone! Please let us know how we can help you. Please help us help wildlife with a contribution! If you would like to donate time, money or other, please let us know!